Sam Witteveen and Martin Andrews started TensorFlow and Deep Learning Singapore in February 2017. The community has grown to 1.6k members in just 8 months. In the interview they discussed some unique challenges with such a rapid growth, and also ways to make the technical content interesting and fun. Sam, Martin, tell us why you decided to start a Machine Learning and Deep Learning community in Singapore. Sam: Martin and I started talking about forming a community in November 2016. We saw that people were interested in Machine Learning and Deep Learning, but there really wasn't a meetup group. We officially started in February 2017 after some intense promotion from our part. Martin was a speaker at a lot of Python events and I did a reach out to the local startup scene. Our philosophy from the beginning was to have content for both beginners and advanced developers combined with lightning talks and/or guest speakers. Martin: Also part of the philosophy is that we won't have a talk without a code: Everybody that speaks needs to show code that works. 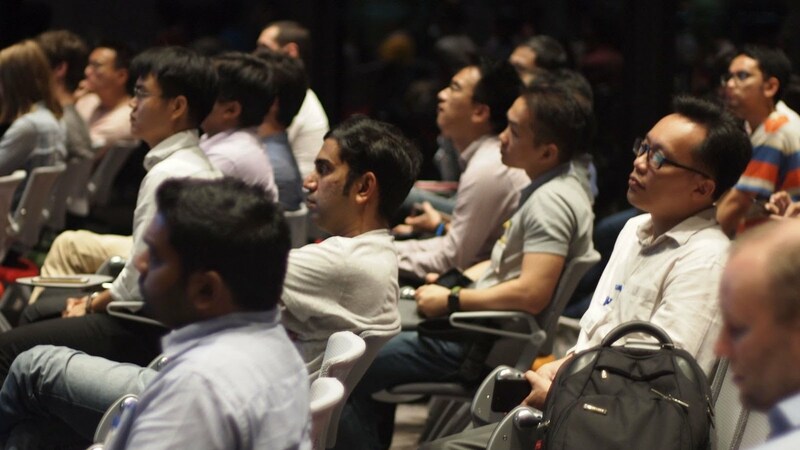 Even though Singapore has a vibrant MeetUp scene and there is a culture of people going out to one or more MeetUps every week, it is rather difficult to get people to speak at events. When we started, we knew this would be a problem, and so both Sam and I have given talks at every one of our events. So even if we don't have a guest speaker, Sam and I make sure there is content for beginners and something more cutting-edge at every event. We also believe that it’s important that events occur regularly, and can be relied upon to be worth going to. Google has been providing a 200-person venue for our events. That is very helpful, because that means we don’t have to worry about that aspect. Is networking part of your events? Sam: I mean we don't stop anyone from networking, but there really isn't time allocated for networking. Having said that, people still network organically. Martin: Pizza, for some reason, is really expensive in Singapore and we haven’t been able to agree on any other good developer food (laugh). So we don't have any food. Our meetups typically run from 7-9pm, and then about half the crowd disperses and the rest just hang out and talk. You were talking about promoting your community's meetups. How did you go about it, what tools did you use? Sam: Word of mouth was how people got to know about us. We also make sure to have at least one “hot” topic, like image captioning, at every meetup. This has been a major factor in bringing people back. Each month we’ve also chosen a focus topic. We have a theme of the month. For instance, we have covered Deep Learning for mobile, different themes around text, etc. Before we had our first meetup, I posted some announcements in the dev and startup Facebook communities. Since then, we've been using Meetup.com and that works well for us. You grew from 0 to 1.6K members in just 7 months. What are some unique challenges associated with such rapid growth? Sam: One of our challenges is how to make the meetups interesting for newcomers that didn't get to experience the earlier meetups, and at the same time for more senior members who want more advanced content. We're now thinking of doing repeats of the beginners content as separate “catch-up” events. Also, because TensorFlow is so cutting edge, we have people coming to meetups with a feeling that this could be useful to them, but they are not 100% sure how. So Martin and I have been actively making ourselves available to talk to. Our challenge is to find people who are doing interesting applications of ML/DL and have them come up and talk about it. Martin: Beginners are not so vocal – they just want to learn. Advanced people always want more advanced stuff. So we have to balance the more vocal elements with our judgement about the right mix. Coming up with new and interesting topics to talk about every month is also challenging. Sam: We're also overgrowing our meetup space (laugh). How difficult is for beginners to enter the world of Deep Learning? Sam: If you know how to code, you can pick up the basics really fast. We were aware that people might not have experience with Python, so we sent out a link to a basic Python class before a “Beginners Day” event that we ran. I was very pleased with the feedback afterwards. Almost all of the 100 people that attended felt like they learned a lot of stuff. Martin: Rather than be exclusive, we try to emphasise that everyone can do Deep Learning. We also try to make all our examples very visual. For example, I recorded myself saying some digits on my Android phone and then we converted those into pictures of spectrograms and used a standard network to tell those apart. This makes for a beginner-level example that is also interesting to more advanced attendees. Sam used the concept of CycleGAN to show what winter looks like in Singapore, which will never happen in real life. We try to empower our community members to try new things and have fun while doing so. Sam: Technology is really interesting if you can show it in an interesting way. I think we earn a lot of respect by showing what didn't work and how we were able to solve it. So we’re not perceived as though we knew everything from the beginning and have all the answers. You mentioned that it is difficult to find people willing to speak at meetups. How are you motivating them and how successful are you in doing so? Martin: We're sending a questionnaire to each new member (MeetUp.com can do this automatically). We’re basically asking how experienced they are, whether they’ve used Deep Learning before, and there’s also a question that asks, “If they're successful, would they talk about it?” Because of the way it is phrased, it's quite hard to say no (laugh). Over 80% have expressed the possibility of speaking, but it is still hard to make it happen. We're trying to make it super simple for people to come up, pushing the idea that if anyone gives a lightning talk which concerns their personal experience of Deep Learning, the whole audience will be eager to hear. It seems that you have a lot of things going on. How do you organize and find time for preparing for meetups and running the community? Sam: Organizing the meetups is not very time-consuming. Preparing the content is what takes a lot of time. Martin: One of my personal reasons for doing this is that I wanted to have an artificial deadline to produce novel content every month. Otherwise, it's very easy to put it off. We also wanted to find out “who is who” in the local scene, because we suspected many people might be hidden at university campuses. Machine Learning and Deep Learning can be applied in many interesting ways. Do you have some examples from your community? Martin: One of our members used transfer learning (where you take an pretrained network and train it to recognize new objects) and trained it to recognize his family from holiday pictures. I had no idea that someone would try something like this, or that it would actually work. I mean the pretrained network wasn’t built for recognising specific people. Sam: We have people working with startups on taking data to track whether elderly people had a fall or not. Based on this data they are trying to predict if they need to send someone to check if this elderly person needs help. Members have their own domain expertise and you give them some tips and it's great when then they come back and tell you if it worked. What in the near future are you looking forward to the most? Sam: Frank Chen from the Google Brain team is coming talk about what's coming up for TensorFlow. That is both nice that he is coming as a speaker, and also that he chose our group to do the announcements for. Sam: We're also definitely open to talk to other organizers, especially if they're in this part of the world and want to give a talk. We're always looking for speakers – and we’d also be happy to speak at other MeetUps in the region.